It’s hard not to giggle like a schoolgirl at a chocolate cake covered in marzipan honeybees. This weekend, my friend Alexis converted a cup of our honey into this tasty cake, every bit as sumptuous as it looks. Paired with mimosas on her back porch, it was the icing on a perfect late summer weekend. Complete with a rather gratuitous and graphic demo of drone bee genitalia explosion at about 2:30. What was I thinking? 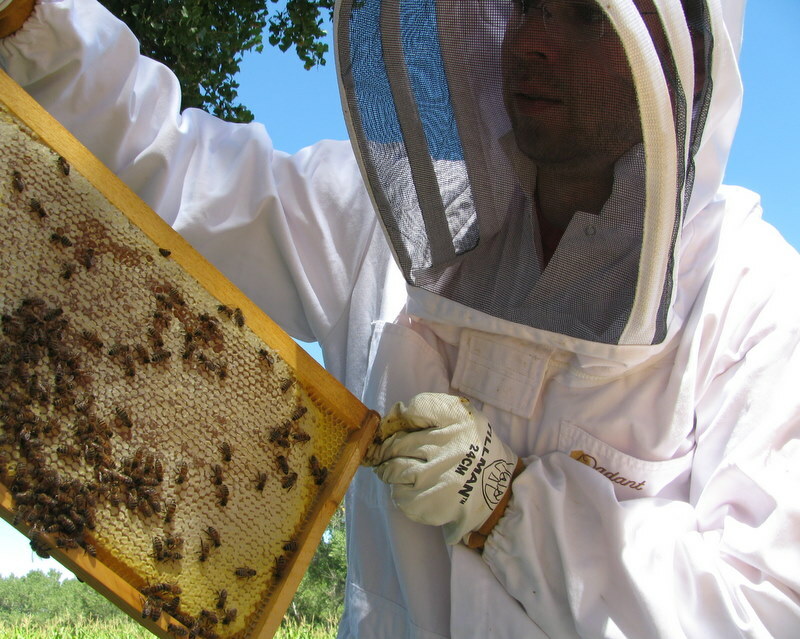 The Bee Team at Google (80 people strong) just harvested its first combs of honey last week. 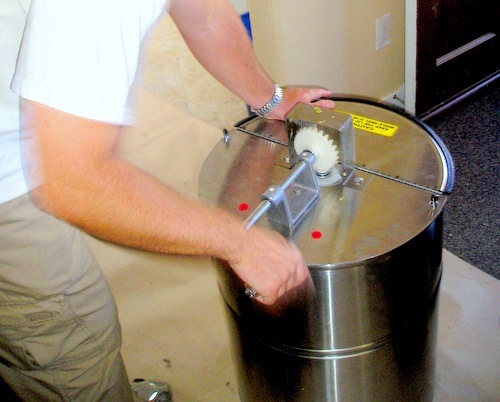 Under the helpful guidance of Bill Tomaszewski of Marin Bee Company, Googlers took turns uncapping the honey (removing the protective wax that bees use to cover a cell once it’s filled with honey), hand-cranking the honey extraction machinery to spin the honey out of the honey comb and pouring the honey through filters to remove the bits of wax and other particles that came from the hive. Forget beekeeping ideology, I’m a pragmatist. And here’s what I’ve come to realize about the benefits and drawbacks of top bar and Langstroth bee hives. Easy on your back A TBH is a dream for anyone with back problems. Hive management To me, TBH requires more time to manage due to frameless combs and non-moveable boxes. Ventilation Lang hives make better use of the chimney effect by allowing heat and moisture to rise up and out of the hive if you’re using a ventilated top cover. The naturalness factor There is something so lovely about watching bees hang comb according to their own whims. The beauty factor Personally, I find TBHs gorgeous. Standardization Langs make it easy to lend out brood comb to a friend in need on the other side of town. Cost I know a guy in town who builds his TBHs for $20 a pop. Harvesting honey There’s nothing like the ease of harvesting honey from a Lang using a clearing board and extractor. Moving hives Langs are far easier to deconstruct and move across town if you happen to have a too-assertive hive in a densely populated part of town. I started my beekeeping adventure 3 years ago with 2 TBHs. 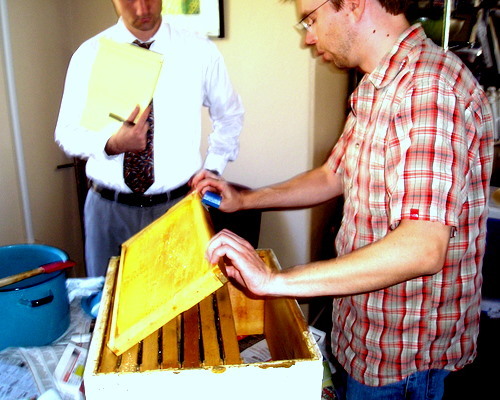 Last year, my husband and I switched to Langstroth hives for a variety of practical reasons perhaps idiosyncratic to us and our lifestyle. It was a tough decision for me as I learned the craft with TBHs and felt a strong emotional pull to their beauty. Though I continue to harbor an aesthetic love for TBHs, for now we’ve found it easier to work Lang hives in the city with our full-time jobs. 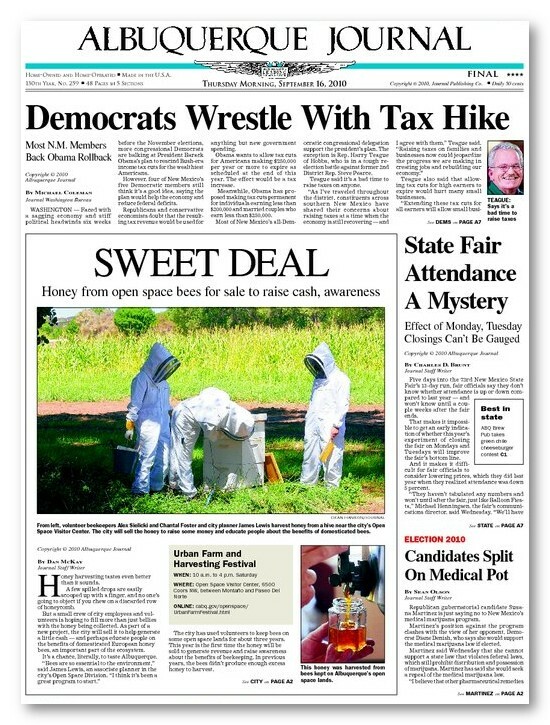 Thanks for reading this week’s beekeeping story in the Albuquerque Journal. Wowza, the girls we manage for City Open Space are now officially cover girls! 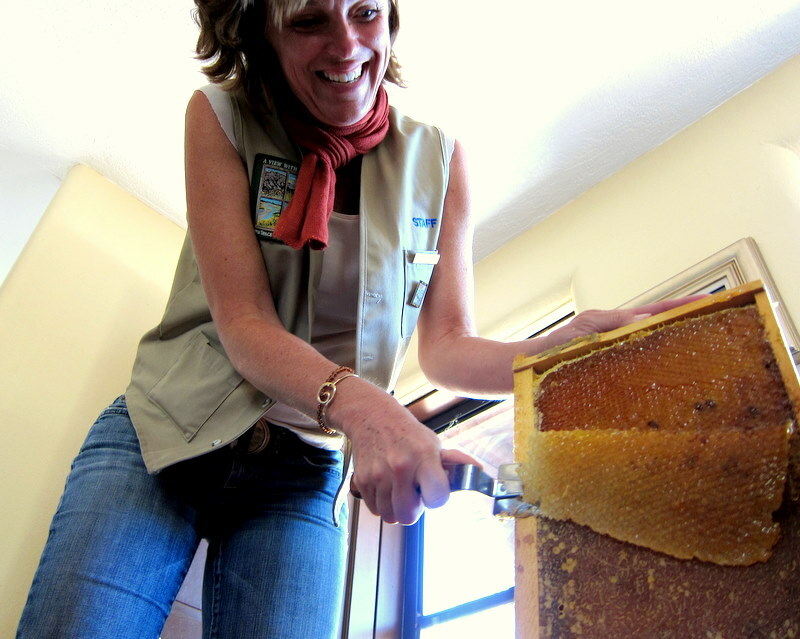 Honey harvesting tastes even better than it sounds. A few spilled drops are easily scooped up with a finger, and no one’s going to object if you chew on a discarded row of honeycomb. But a small crew of city employees and volunteers is hoping to fill more than just bellies with the honey being collected. As part of a new project, the city will sell it to help generate a little cash — and perhaps educate people on the benefits of domesticated European honey bees, an important part of the ecosystem. 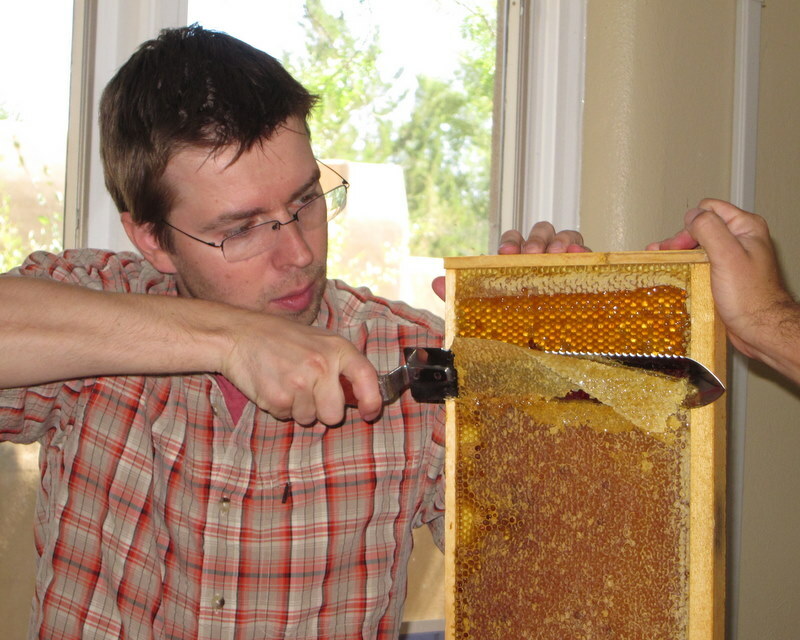 Or, if you’re just looking for a few photos of journalist Dan McKay getting all sticky with honey, I’m happy to help out. 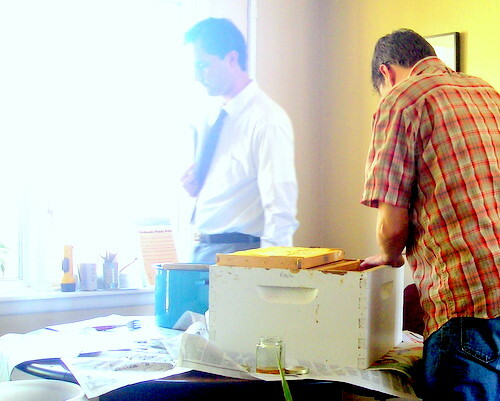 Together with Jodi and James from the City Open Space crew, we harvested a box of honey from the cottonwood tree hive. It’s a dark buttery fall honey without a hint of astringency. As part of our volunteer efforts, we kindly tracked honey and mud all throughout the Westside Visitor’s Center and used every wet towel on site. 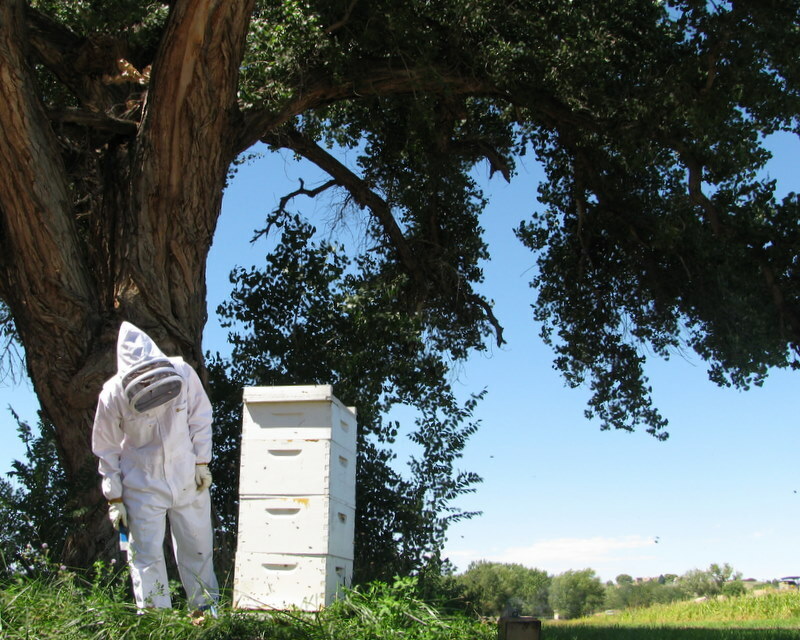 Want to try Albuquerque Open Space honey and donate to their programs? You can buy a jar or two at this Saturday’s Urban Farm Fest but get there early as supplies are limited. I never thought I’d see a grown man spraying silicone on a statue of Ganesh at a church in Santa Fe but then again, it IS Santa Fe. And these WERE your usual bunch of iconoclastic beekeepers. The Ganesh-sprayer in question was Steve Walls of Buckin’ Bee, demonstrating how he makes his own wax candle molds for beeswax candles that ahem… sell well in Santa Fe, the epicenter of alternative thought. Steve may have been the day’s comic relief but the headliner was scientific beekeeper Randy Oliver, flown in from CA for our New Mexico seminar. Here are just a few photos of the rodeo.